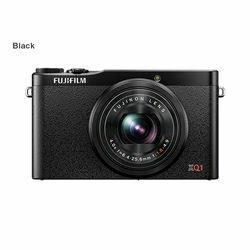 The FUJIFILM XQ1's all-metal body is of the highest quality. With a stylish upper control deck, the black body has a crepe touch, while the silver body is fully anodized with a single tone finish matching the upper control deck. This high quality texture lets users feel the joy of holding the camera in their hands. To maximize the power of the lens, Fujifilm has removed the optical low-pass filter from its X-Trans™**CMOS II sensor. In addition, the camera features a "Lens Modulation Optimizer," which minimizes diffraction and chromatic aberrations by digitally processing images to improve sharpness and clarity. Extraordinary resolution can be experienced with simple shooting in JPEG format. The FUJIFILM XQ1 features a Fujinon 4x optical zoom that covers 25-100mm***. The adoption of highly-refractive aspherical lenses facilitates the F1.8 brightness at the widest point. Clear images are captured even in low-light thanks to 3.0-stop*4 image stabilization and multi-layer coating technology unique to Fujinon. The control ring offers operability similar to analog cameras. You can set your preferred functionality in advance and then use the control ring to finely adjust settings, without going to the menu screen. The user can set functions such as the aperture, exposure compensation and ISO of their choice. With the "Wireless Image Transfer" function, images are easily transferred to smartphones and tablets simply by pushing the Wi-Fi button. Users can set the camera up to read its location from smartphones and tablets enabling you to keep tabs on where you took your photos. By using PC Auto Save, a backup of your pictures can be saved to your PC in just a few seconds. The FUJIFILM XQ1's all-metal body is of the highest quality. With a stylish upper control deck, the black body has a crepe touch, while the silver body is fully anodized with a single tone finish matching the upper control deck. This high quality texture lets users feel the joy of holding the camera in their hands. X series Image QualityTo maximize the power of the lens, Fujifilm has removed the optical low-pass filter from its X-Trans™**CMOS II sensor. In addition, the camera features a "Lens Modulation Optimizer," which minimizes diffraction and chromatic aberrations by digitally processing images to improve sharpness and clarity. Extraordinary resolution can be experienced with simple shooting in JPEG format. Bright F1.8 lensThe FUJIFILM XQ1 features a Fujinon 4x optical zoom that covers 25-100mm***. The adoption of highly-refractive aspherical lenses facilitates the F1.8 brightness at the widest point. Clear images are captured even in low-light thanks to 3.0-stop*4 image stabilization and multi-layer coating technology unique to Fujinon. Easy setting selection via the control ringThe control ring offers operability similar to analog cameras.You can set your preferred functionality in advance and then use the control ring to finely adjust settings, without going to the menu screen. The user can set functions such as the aperture, exposure compensation and ISO of their choice. World's fastest 0.06 seconds Phase Detection AFWith its impressive phase detection AF speed of 0.06 seconds it is the fastest in the world. Fujifim's EXR Processor II, the latest image processing engine, offers high-speed performance that captures any photo opportunity with a start-up time of 0.99 seconds, shooting interval of 0.3 seconds*5, shutter time lag of 0.015 seconds and continuous shooting of 12.0 fps Transfer images to your smartphone with one push of a buttonWith the "Wireless Image Transfer" function, images are easily transferred to smartphones and tablets simply by pushing the Wi-Fi button. Users can set the camera up to read its location from smartphones and tablets enabling you to keep tabs on where you took your photos. By using PC Auto Save, a backup of your pictures can be saved to your PC in just a few seconds. Focal length f=6.4 - 25.6mm, equivalent to 25 - 100mm on a 35mm format. Macro Wide : Approx. 3cm - 3.0m / 1.1 in. - 9.8 ft.
Shutter speed (Auto mode) 1/4 sec. to 1/3000 sec., (All other modes) 30 sec. to 1/4000 sec. Red-eye removal OFF Auto / Forced Flash / Suppressed Flash / Slow Synchro. Red-eye removal ON Red-eye Reduction Auto / Red-eye Reduction & Forced Flash / Suppressed Flash / Red-eye Reduction & Slow Synchro. Movie recording Full HD 1920 x 1080 60p / 30p Continuous recording : up to approx. 14 min.